She was a perfect mix of sophistication and fresh-faced beauty. Laraine Day was an All-American girl next door, who played Nurse Mary Lamont in the “Doctor Kildare” film series while under contract to Metro-Goldwyn-Mayer. Day co-starred with top Hollywood stars such as John Wayne, Cary Grant, Lana Turner and was directed once by Alfred Hitchcock. 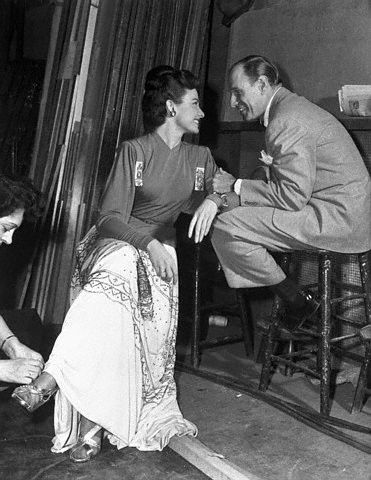 Day and Durocher smitten on the set of “Tycoon” in 1947. The sweet-as-pie actress married the baseball infielder and manager, Leo Durocher. Nicknamed “Leo the Lip,” Durocher was a controversial figure in the sport, known for being outspoken. Durocher’s professional baseball career began in 1925 playing with the New York Yankees and continued on with the Cincinnati Reds from 1930 to 1933, St. Louis Cardinals from 1933 to 1937 and the Brooklyn Dodgers from 1938 to 1941, 1943 and 1945. Durocher managed the Brooklyn Dodgers, New York Giants, Chicago Cubs, Houston Astros and Taiheiyo Club Lions. Durocher was the manager of the New York Giants from 1948 to 1955 while he was married to Day. Day served almost as a mascot and public relations manager for the team. She was friends with the ballplayers, their wives and the sportswriters and their wives. She was said to have polished the rough Durocher. 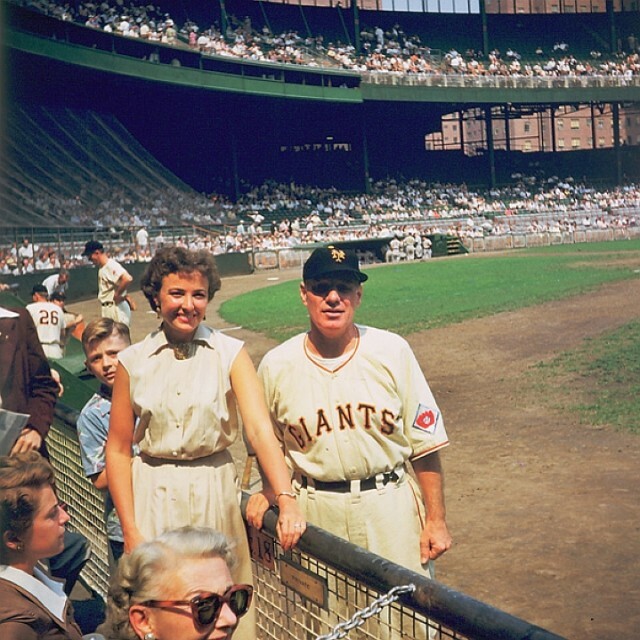 Day even hosted a “Day with the Giants,” which was a 15 minute television broadcast before each Giants home game. She also wrote the books about the teams called “Day with the Giants” (1952) and “The America We Love,” though the books are also said to be ghostwritten. While they were married, she would watch nearly 77 games each year. Day cheers for the Giants in 1948. She even adjusted her film career around his career, only making one movie per year and doing the occasional television show. During the season, Day would go to spring training and attend every home game but stayed home with the children when the team went on the road, according to the article. But before meeting Durocher, Day wasn’t a baseball fan. She didn’t even know who he was. Day, then married to musician Ray Hendricks, met Durocher at the Stork Club in 1944. Everyone applauded when he entered and Day asked a friend who he was. The friend told her Durocher played for the Brooklyn Dodgers and Day apparently asked, “What’s a Dodger?,” according to the book “The Victory Season: The End of World War II and the Birth of Baseball’s Golden Age” by Robert Weintraub. But the ice melted two years later when Day met Durocher on a flight. She was on her way to Minneapolis and was delayed in Chicago. So was Durocher. By the time their flight left, Day was smitten, according to the book by Weintraub. Durocher was a well-known ladies man, being seen on occasion with actresses Betty Hutton, Linda Darnell and Copacabana show girl Edna Ryan. Hollywood’s nice girl started an affair with the rough baseball player, and eventually filed for divorce with Hendricks in 1946. She was granted an interlocutory divorce from Hendricks on Jan. 20, 1947, meaning she had to wait one year before remarrying, according to Weintraub. However, on January 21, 1947, Day traveled to Mexico where she received a second divorce decree and joined Durocher in Texas to be married. Day and Durocher were then surrounded by gossip and scandal, with Day being called an adulterer and bigamist. It was deemed the Mexican divorce was not legal and her Texas marriage was illegal. 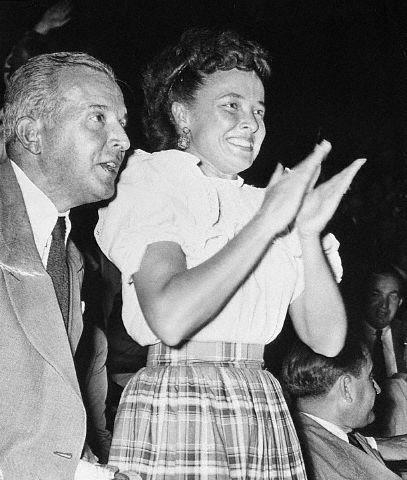 A year later, in February 1948, the two remarried and the Associated Press reported “Laraine Day, Leo Durocher to Wed Again.” Durocher was 42 and Day was 27, the Associated Press reported in the Feb. 14, 1948 article. In 1955, Day found herself in another “scandal,” while she found herself in an unintentionally groundbreaking photo. Center fielder Willie Mays played for Giants while Durocher was manager, and Day adored the ballplayer. April 1955 Sports Illustrated cover with Willie Mays, Laraine Day and Leo Durocher. The cover sparked controversy in 1955. “While I interviewed many ballplayers, the favorite of all is Willie Mays, who suffers tortures in the air and yet wins the heart of everybody,” Day is quoted in “Willie Mays: The Life, The Legend” by James S. Hirsch. 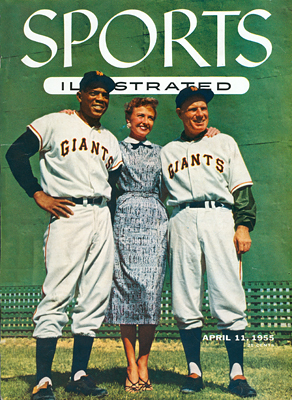 Mays, Day and Durocher were featured on the April 11, 1955, cover of “Sports Illustrated.” Day stands between the two men with her hands on both of their shoulders. But in 1955, it was an outrage that a white woman would have her hand on a black man’s shoulder. Letters were sent to the magazine, now only a year old, from outraged readers and others asking to cancel their subscriptions, according to Hirsch’s book. After 13 years of marriage, Durocher and Day divorced in 1960. After their divorce, Day said she was done with baseball, according her New York Times obituary. “When our relationship was over, so was my relationship with baseball,” the obituary quoted Day. However, Day did return to baseball once more in 1994. Durocher, who passed away in 1991, was posthumously inducted into the Baseball Hall of Fame in Cooperstown, NY. Day attended the ceremony in 1994 on her former husband’s behalf. This entry was posted in Star Profile and tagged Laraine Day, Laraine Day Durocher, Leo Durocher by Jnpickens. Bookmark the permalink. It should be noted that when Day and Durocher married in February 1948, Leo was manager of the Dodgers, not the Giants. He’d held the position since the start of the ’40s, but had been suspended for a season in 1947 (the year Jackie Robinson integrated MLB) for relationships with gamblers. Durocher managed Brooklyn for roughly half the 1948 season, but the Dodgers got off to a slow start and general manager Branch Rickey decided to make a change. It just so happened that the Giants were off to a sluggish start, so the front offices agreed to send Durocher from Ebbets Field to the Polo Grounds, replacing one-time Giants star Mel Ott, with Brooklyn’s ’47 manager, Burt Shotton, coming back to the Dodger dugout. Given the intense rivalry between the teams, you can imagine how this went over. Giants fans in particular were initially incensed that the manager from hated Brooklyn was replacing one of their heroes. But the Giants faithful eventually warmed to Durocher as the team gradually improved, and by 1951 — the year the team won the NL pennant over Brooklyn on Bobby Thomson’s famous “shot heard ’round the world” — Leo was beloved at the Polo Grounds, and the love intensified after the team won the World Series in 1954, beating heavily favored Cleveland,in a four-game sweep. Thanks for the information, Vincent! The Polo Grounds was the name of the ballpark, at the upper end of Manhattan, just across the Harlem River from Yankee Stadium in the Bronx — and I don’t think polo ever was played on the site. However, an earlier version of the ballpark on a different site happened to be where polo was played, so the name stuck. It’s similar to Manhattan’s indoor arena, Madison Square Garden — it’s long been called by that name, even though it hasn’t been located at Madison Square for more than 100 years. Now and then, TCM shows an old tv show from the 1950s, Screen Directors Playhouse. There is an episode that I saw that starred Day and Durocher and Jeanette MacDonald. They re-run these every 2 months or so. The one they were in was a comedy, usually the episodes are dramas. I’ve seen that one! I really enjoyed it.